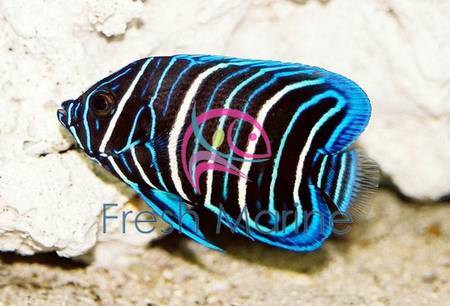 https://sep.yimg.com/ay/yhst-33477391359232/blueface-angelfish-juvenile-pomacanthus-xanthometopon-blueface-angel-fish-6.jpgBlueface Angelfish Juvenile - Pomacanthus xanthometopon - Blueface Angel Fish ModerateSemi-aggressive135 Gallon15 inchesYes, with CautionOmnivore, Greens, Pellet, FlakeIndian and Pacific OceansPomacanthidaeSmall 2" - 3"
The Blue Faced Angelfish is a strikingly colored larger than average angelfish that makes a spectacular addition to any large aquarium system. This Angelfish is found throughout the tropical Pacific and Indian oceans and is relatively hearty. It feeds on a wide variety of foods including flake foods, however, large adults will need additional food to give the volume needed to sustain them. Like many of the larger angelfish the Blue Faced Angelfish has a separate color pattern when it is young. The juvenile color pattern is dark blue with a white striped pattern. As the fish grows larger this pattern changes into the striking blue and yellow pattern of the adults. As a juvenile, the body is covered with alternating vertical stripes of black, white, and sapphire blue. Upon growing to approximately five inches, the juvenile begins to morph into its adult coloration of pale yellow with bluish scales and a bright-yellow pectoral fin. It has a mottled-blue face with yellow mask that extends from eye to eye but not much beyond each eye. There is also an eyespot at the caudal end of the dorsal fin. A minimum of a 100 gallon tank with numerous hiding places and large amounts of live rock for grazing will offer a good environment. Not a good reef dweller, the Blueface Angelfish is prone to nip at stony and soft corals (sessile invertebrates) and clam mantles. The Blueface Angelfish is best kept as the only angelfish, as it is prone to becoming territorial when it is the largest fish in the tank. Specific Care Information: The Blue Faced Angelfish is not reef safe, but can be kept successfully in large aquariums. It is not particularly aggressive, however, as with other large angel of fish there should generally be only one per aquarium. Diet: Feed the Blueface Angelfish a varied diet of meaty marine foods such as shrimp, mysis shrimp, clam, scallop, squid, and silversides. Be sure to offer marine algae such as Spirulina and dried sheets of nori. Feeding nori is best accomplished by tearing off a strip and inserting it into a lettuce clip or between your cleaning magnets. To encourage good coloration, it is recommended to feed commercially prepared Angelfish formula that contains marine sponge material. In order to maintain the proper amount of body fat for this fish, it will likely need to be fed 2 - 3 times daily. Breeding and Propagation: The Blueface Angelfish are hermaphroditic, difficult to breed, and indistinguishable in color from male to female.